The Old English style of poetry is full of riddles and puzzling metaphors. Mind puzzles are also notable societal rituals that are seen in almost every type of civilization's literature. The riddle has existed in many forms, and in many dissimilar civilizations for thousands of years. In Ancient Greece, puzzling riddle-like statements were discussed frequently by philosopher's like Aristotle and Plato. Edgar Allen Poe is one of the most known authors that was widely accepted because of his of intriguing riddles in story-lines. A plane containing 5 people crashes into an uncharted island, and all of them survive for a limit of 5 days. 2 of them build themselves graves and die in it from the hard work. 1 person fills one of the graves with dirt and then dies next to it on day 3. The last two people build 3 graves, and put in one of the corpses, but 5 years later, 11 people are not in their graves, yet the graves are full of corpses. How? On day four, the last two survivours(who are different sexes)found food which will last each of them 4 more years, and on the fifth day, they began reproducing. By the fourth year, ten children have been taught how to raise themselves. The children were thoughtful and put their corpses in the grave. A young man, living in Manhattan, New York, has two girlfriends. One lives to the North, in the Bronx, and the other lives to the South, in Brooklyn. He likes both girls equally but can only visit one each weekend. He therefore leaves it to chance and takes the first train that arrives when he reaches the train station. Even though the man arrives at a totally random time every Saturday morning and the Brooklyn and Bronx trains arrive equally often (every ten minutes), he finds himself visiting the girl in Brooklyn on average nine times out of ten. How could the odds so heavily favor taking the Brooklyn train? Hint: Think of a way the train schedules might favor one train over the other. The Brooklyn train leaves exactly 1 minute before the Bronx train. Let's say the Brooklyn train arrives at 09:00, 09:10, 09:20, etc. and the Bronx train arrives one minute after at 09:01, 09:11, 09:21, etc. Consider the ten minute interval from 09:00 to 09:10. If the man arrives between 09:00 and 09:01, the 09:01 Bronx train will be the first to arrive (assuming that he doesn't arrive at exactly 09:00). If the man arrives between 09:01 and 09:10, the 09:10 Brooklyn train will be the first to arrive. In any ten minute period, the Brooklyn train will be the first to arrive in nine of the ten minutes. Walking home one day, you take a short cut along the train tracks. The tracks cross a narrow bridge over a deep gorge. At the point you are 3/8 of the way across the bridge, you hear the train whistle somewhere behind you. You charge across the bridge, and jump off the track as the train is about to run you down. As it happens, if you had gone the other way, you would have reached safety just before being run over as well. If you can run ten miles per hour, how fast is the train moving? The train is moving at 40 miles per hour. Imagine that a friend is walking with you. When the train whistle blows, you head away from the train, he heads toward it. When he reaches safety, you will be 6/8 (or 3/4)of the way across the bridge, and the train will have just reached the bridge. For the train to cross 4/4 of the bridge in the time you cross the remaining 1/4, the train must be moving four times your speed. Wished to have him for her own. He his people led away. 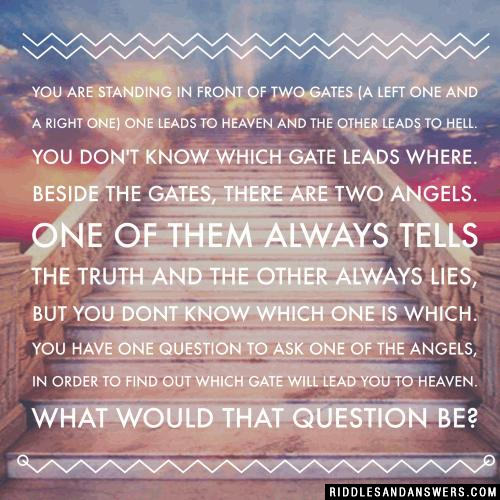 You are standing in front of two gates (a left one and a right one) one leads to Heaven and the other leads to Hell. You don't know which gate leads where. Beside the gates, there are two angels. One of them always tells the truth and the other always lies, but you dont know which one is which. You have one question to ask one of the angels, in order to find out which gate will lead you to Heaven. What would that question be? The question is: What would the other angel say, if I asked which gate leads to Heaven?. And do exactly the opposite of what the angel says. The angel that tells the truth will say that it's the right gate since it knows that the other angel will lie. The angel that lies will also say that it's the right gate since it knows that the other angel will tell the truth. The same explanation applies if the right gate leads to Heaven. Can you come up with a cool, funny or clever Long Riddles of your own? Post it below (without the answer) to see if you can stump our users.